KIEV, Ukraine -- As tensions rise with Ukraine, as Russia seeks to establish a Eurasian Union, and as Vladimir Putin stands unopposed for the Russian presidency, one has to ask whether the European Union has written off the concept of one Europe and is now helping to build a new psychological wall in the East, says Viktor Tkachuk, head of "People First", the Ukrainian Foundation for Democracy. 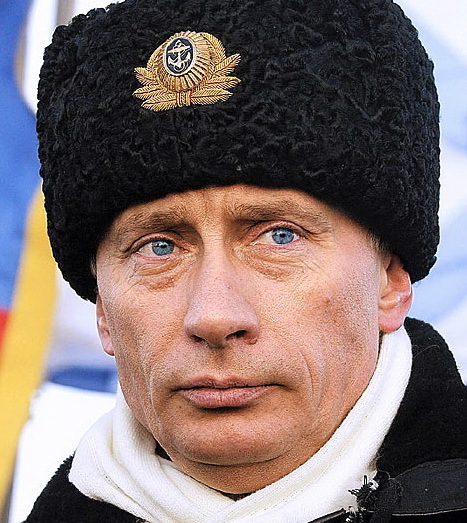 Is Vladimir Putin looking to build a new Iron Curtain? "When the Berlin Wall fell in 1989, a huge sigh of relief was heard echoing through the hallowed halls of European power. The ‘Evil Empire’, as Ronald Reagan described it, was gone and there was a chance of a new beginning; a united Europe under the flags of universal suffrage, democracy and justice. Politicians made eloquent speeches, aid money and support flowed eastward and all in the hope that the countries Eastern Europe in particular would eventually take their rightful place in the European family of nations. However, whilst this may have been the intent, current events within the European states of the former USSR would appear to indicate that Europe remains as divided as ever. Like all disagreements, it starts with lack of understanding. Europe assumed that as a result of their sizeable investment in the building of a market economy and that of the USA and Canada, the countries of the former Soviet Union would somehow turn democratic. Those in the former USSR believed that they understood the principles of democracy and assumed that their established day to day practices would somehow evolve into democracy. At the height of its power, the Soviet Union had more millionaires than the USA, the only difference being that the majority of Soviet millionaires had made their fortunes by abusing the Soviet financial system. Their fortunes were mainly illicit and it was they who greatly undermined and eventually brought about the fall of the Soviet system. It is these millionaires who have become the billionaire Oligarchs that control much of the region’s wealth today. These are not public school boys brought up in the environment of old Europe; they are people whose psychology is hard wired to the methods of the Soviet era where justice could be bought and where money and power were the only incentives. It is therefore little wonder that the region’s legal and financial systems are crumbling and that the region's post-Soviet leaders feel they need to rule with fists of iron as opposed to the rule of law, as in many ways the only real law is their authoritarian power. Europe’s second fundamental oversight has been not to grasp the opportunity presented by the younger generations. In Ukraine recent research by the People First Foundation has irrefutably demonstrated that whilst over 90% of the population understand the principles of democracy and believe this is the right way for Ukraine, less than 5% understand how it works in practice. To put it into perspective, teenagers in Ukraine today are taught democratic theory for only 4 hours and as a part of their ‘Soviet-era’ classes on political philosophy, yet to obtain a driving licence, the same teenager will have a minimum of 20 hours of instruction. Europe, with all its colonial experience, should have recognised the need for formal education in democratic practice so that the younger generations at least understood how to build political parties from the bottom up, how local government functions and most of all the role of the individual within a democratic society. Had this been done from the outset, then 20 years on Ukraine and many of the other counties of the Commonwealth of Independent States would now be harvesting the fruit and many of today’s issues would never have surfaced. The result of this oversight is that in Ukraine whilst power is understood, the democratic control of power is not, as the very principle of leaders being controlled by the people is diametrically opposed to the political traditions of the past. The politicians of all parties may preach their perception of democracy but in reality they are just as blind as current teenage school children. Ukrainian politics today is all about power, money and totalitarian control; it is not about European values or even how to achieve them. It is, in reality, the spirit of the past filling the vacuum of the present which was created by European and US political assumptions back in the 1990s. Ukraine is rapidly becoming a totally polarised state between an uncaring and all-powerful super rich and some of the worst poverty in Europe where the middle class has been virtually taxed out of existence. As the Soviet era politicians retire or die out there are few ‘new era’ politicians of note to replace them. There is no training for the leaders of tomorrow; thus the majority of young ‘politicians’ have the perception that the current way is right and acceptable. In reality few have any acceptable principles, morals or values. They consider their immunity from prosecution to be a right and the corruption of the judiciary and the political system as normal and acceptable. Their ideals are not the national interest but their personal wealth and as a result Ukraine runs the risk of degenerating into financial and social chaos and with it the potential risk of a resurgence of ‘extreme Sovietism’ or 1930s-style neo-fascism, both of which will be equally unpalatable and potentially dangerous for Europe. Europe needs to act and act quickly. Undesirable as it may seem at seem, a more equitable solution for Europe and for the people of Ukraine would be a continued dialogue on the Free Trade Agreement but with the inclusion of points of European principle, namely the independence of the judiciary, and free and fair elections. Europe must not make the mistake of believing that an agreement on the wording of the FTA means a commonality of understanding as the psychologies of the parties are almost diametrically opposed. The isolation of the present government, desirable as it may seem, and the suspension of the Free Trade Agreement would be a step in the wrong direction simply because once threatened this administration will adopt the Soviet stance of intransigence and move eastward, irrespective of the consequences for the nation and for the people. If that were to happen, then the rebuilding of the Russian ‘ideal’ could be completed and with it the risk of a new iron curtain descending across the continent not just because of differing political idealism, but also because of our mutual inability to understand and recognise reality on both sides."